Congrats on taking your evidence exam. I heard you had a few more layouts to share...but could that be concieved as heresay? What am I working on right now? A mini album for my nephew. Well actually I will be finishing it after I finish up my book work. Congrats on surviving the exam...LOL. I must admit, it does sound like an exciting field. (Law, that is). Congrats on taking your evidence exam and love the layout! Very cute LO. I'm playing catch up with my 365 and week in the life projects. I love that layout Keshet! Those flowers on the bottom are just beautiful! 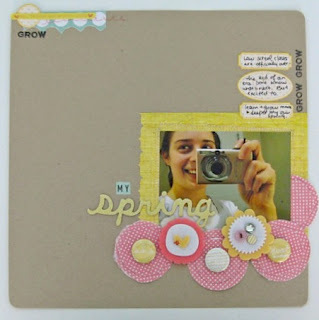 Also came over to comment on your June ST layout-love that one and definitely lifting it! Thanks for all the nice comments on my blog-very much appreciated! congrats on your exam! I love your page! So simple yet so striking! Congrats on the exam! This layout is great, I just commented on it on the SC gallery. Thank you so much for your lovely comment on my "Spice Market" layout. It made my day! I love this page SO much! The journalling on the stickers, the flowers and the details at the top of the page. I love white space! Such happy colours too. Oh, I know what you mean about evidence. Not one of my favorites. But, I do love this LO! And, I had to laugh about your poor Slice. This is precious-- those flowers are adorable! I love this page! Great composition and design! Evidence and hearsay . . . ugh, I just got a pit in my stomach remembering my exams in law school (that was quite a long time ago). Congrats on surviving the exam! I so like the flowers, cute! Found your link via Megan's blog!